The Ukrainian language (Ukrainian: українська (мова), transliteration: ukrajins'ka mova) is an Eastern Slavic language. This language is a part of the Indo-European language family. 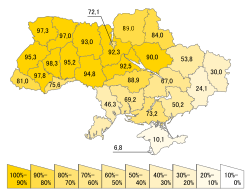 Ukrainian is the second most spoken Slavic language. It is the official language of Ukraine. There are 37 million speakers in Ukraine. Most of them are native speakers. All over the world there are more than 50 million speakers. The Ukrainian language is written with Cyrillic letters. Some words are similar to the Polish language. 2only after consonants; a capital letter does not exist; the soft sign ь is not a letter representing a sound, but modifies the sound of the preceding letter, indicating palatalisation ('softening'). 3an apostrophe (’) is used to mark de-palatalization of the preceding consonant. ↑ The status of Crimea and of the city of Sevastopol is since March 2014 under dispute between Russia and Ukraine; Ukraine and the majority of the international community consider Crimea to be an autonomous region of Ukraine and Sevastopol to be one of Ukraine's cities with special status, whereas Russia considers Crimea to be a federal subject of Russia and Sevastopol to be one of Russia's three federal cities. ↑ 3.0 3.1 3.2 3.3 3.4 3.5 "List of declarations made with respect to treaty No. 148 (Status as of: 21/9/2011)". Council of Europe. Retrieved 2012-05-22. ↑ "National Minorities Policy of the Government of the Czech Republic". Vlada.cz. Retrieved 2012-05-22. ↑ "Implementation of the Charter in Hungary". Database for the European Charter for Regional or Minority Languages. Public Foundation for European Comparative Minority Research. Archived from the original on 27 February 2014. Retrieved 16 June 2014. This page was last changed on 14 April 2019, at 14:36.